Spooky goings on. Sir William Crookes - Nineteenth Century Physicist and... Ghost Hunter? Sir William Crookes (1832-1919) was a well-regarded chemist and physicist with numerous awards and recognitions to his credit. Perhaps more intriguingly, he was the first to bring the "scientific method" to bear on the question of psychic powers. Crookes spent many years testing various aspects of psychic phenomena. Early in his quest to find answers in the sub-culture of psychics and mediums, a culture rife with fraud in the 19th century, Crookes was duped several times. To fall prey to this avaricious intent significantly irked Crookes, and caused him to refine where his experiments were run. Crookes had a laboratory in his home which he utilized for all his later experiments, testing the veracity of automatic writing, movement of heavy items with light contact or no contact, percussive sounds, alteration of the weight of objects, levitation of objects and humans, luminous appearances, appearance of hands both luminous and solid, appearance of forms and faces, and many other uncategorized oddities. 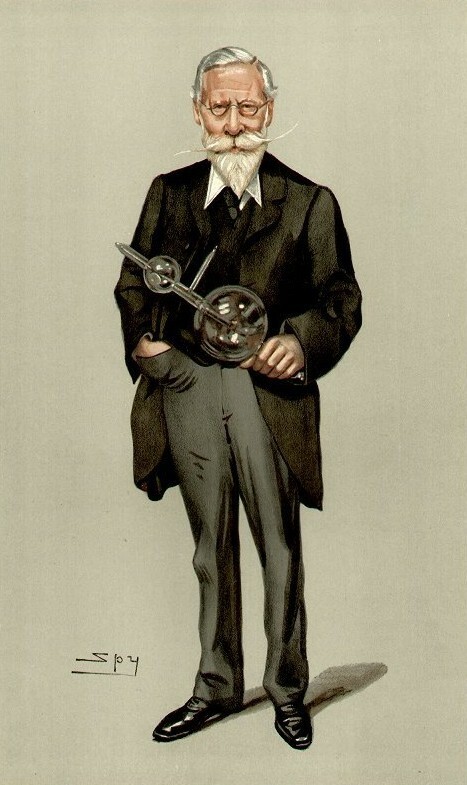 Caricature of Sir William Crookes. Circa 1903. The caption read "ubi Crookes ibi lux", which is roughly translated as, "Where there is Crookes, there is light." "I have both seen and heard, in a manner which would make disbelief impossible, things called spiritual, which cannot be taken by a rational being to be capable of explanation by imposture, coincidence, or mistake... The physical explanations I have seen are easy, but miserably insufficient. The spiritual hypothesis is sufficient, but ponderously difficult." Crookes's psychical experiments predated the founding of the Society for Psychical Research (SPR) in 1882. The SPR went on to research the previously mentioned phenomena at an international level. It is important to remember Crookes was not some common dabbler in science. A brief list of his research would include, but is not limited to, meteorology, chemistry, economics, spectrometry, radiation, and cathode rays. The cathode ray term lives on with us today in the truncated form of CRT (cathode ray tube) that many still use to view TV shows or surf the web. Crookes is probably most famous for his "Crookes Tubes" which he developed during his studies of cathode rays, streams of electrons generated by electrical energy in a low pressure environment. When these "rays" were found to have traits of particles they were termed corpuscles before receiving their final term of electrons. Not all of Crookes’s tubes were for experimentation. Many were made to entertain the well-heeled attendees of Victorian parties. One can only imagine the anticipation of the guests as Crookes set up equipment that would make a Steampunk aficionado salivate. Then, as the arcane machinery came to life with the loud spat of high voltage arcing, the tube would glow. A darkened room lit by the stroboscopic effect of the spark gap oscillator and a glowing object of art the centerpiece - the perfect warm up for a séance. While it is not known if Crookes demonstrated his tube simultaneously with a séance, it is known that he did attend séances with a multitude of apparatus in tow. Crooks performed many experiments and tested several spiritual mediums attempting to quantify spiritual power. He designed many complicated testing mechanisms to record measurable changes in the physical world on paper. Most of his experiments were carried out in his own laboratory under his terms mitigating the chance of deception. During one of these "in house" experiments he generated a paper tape readout of Daniel Home (his most "remarkable" subject), changing the weight of an object suspended inside a glass case. Another of his subjects was Miss Florence Cook who would call forth an entity who called herself Katie. This was problematic for Crookes as mediums were notoriously finicky, with Miss Cook being no exception, insisting on darkness and seclusion behind a curtain. However this did not deter Crookes who devised a different form of lighting (phosphorus lamp) and other adaptations to his home to accommodate her while meeting his experimental demands. Crookes regretfully notes that he arrived in the eleventh hour of Miss Cook's career but he did spend several months working with her. The crux of this series of tests can be boiled down to a single question: can a woman, barely 20 years old, so hoodwink a man and several hand-picked witnesses in his own home so that she appears to be in two places at once under the guise of low light conditions? Under the scrutiny of Crookes and three or four other witnesses, Katie, Miss Cook's projection, did many things including shaking hands, exchanging embraces, holding babies, and having her photo taken. Crookes also took great pains to measure Miss Cook’s and Katie's respective heights and builds, including face shape. Crookes's notes show them to be demonstrably different. Miss Cook, demonized in the press of the time, was never proven a fraud by Crookes; in fact, he remained impressed by her veracity throughout his life, much to the detriment of his personal reputation. One of Crookes's most spectacular experiments was the testing of Daniel Home "playing" an accordion without touching it, or only lightly touching it. The accordion was purchased that day and was brand new. There were several witnesses including a respected fellow physicist, a police sergeant, Crookes's brother, and his chemical assistant. The mesh cage's largest opening was less than 2 inches by 1 inch and was placed on the floor and under a table with no room for foot or hand at top or bottom. Home, whom had been watched by Crookes since when he was picked up, sat in an easy chair with his legs athwart the cage. With Crookes one side and another witness on the other, they each placed a foot on one of his to detect any movement. The cage was then moved out from the table, the accordion placed inside with its keys down, and Home grasped the accordion's higher end (without the keys) between thumb and forefinger and the cage was pushed back under the table, but not so far as to hide Home's hand, his other hand resting on top of the table. The instrument moved with no noticeable movement from Home, a few notes were tentatively played, and Home removed his hand from the cage leaving the accordion floating and undulating inside. Home then reached back in the cage and lightly touched the instrument which obliged him by playing a cheery contemporary tune. Many people, such as the great early 20th century magician Houdini, have dismissed Crookes and his experimental findings. Labeled credulous, wishful, a dupe, and many other unflattering terms, they look back and poke holes in his experiments. One detractor suggests that Crookes must have purchased a self-playing accordion (which were available at the time) or that it was operated by Home with strands of catgut, while he played melodies on a mouth organ hidden in his bushy mustache. Crookes's notes rebut all of his critics, many who appear to have not read his writings. Said the Bard. Sir William Crookes made one of the firmer efforts to discover what was between heaven and earth, taking it out of philosophy and dragging it into the sunlight of the real world. Crookes will likely remain an enigma to all those that study his life. Do you want to write for us too? If so, get in touch by clicking here!